It’s always a bit puzzling when a character in a movie decides to spend a considerable amount of time in a house that we know is haunted. Such situations — common enough in horror movies — put the audience a couple of steps ahead of the characters and tend to turn horror films into predetermined rituals that deliver their shocks with time-table efficiency. The Woman in Black — a new hunk of horror based on a London stage play — more or less fits into such a standard horror mold, but does a good enough job to merit attention. At its best, The Woman in Black — set in the early part of the 20th century — is plenty creepy. Part of an attempt to revive a venerable name in British horror, Hammer Films, The Woman in Black also is notable as a starring vehicle for Daniel Radcliffe, known to most audiences as child wizard Harry Potter. 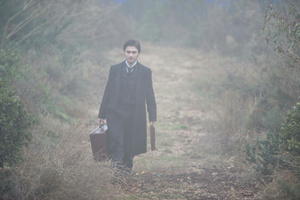 In The Woman in Black, Radcliffe plays a young lawyer who’s sent to a dreary English village to organize the papers of a deceased woman. Radcliffe’s Arthur Kipps, is also a widower with a young son. He leaves the boy in the care of a nanny when he sets out to tackle his legal assignment. Upon arrival in this bleak rural village, Kipps receives the cold shoulder from the townsfolk, who warn him not to go to the deceased woman’s home, a dilapidated mansion outside the town. The townsfolk, of course, have a point. Every time someone visits the rotting old manse, one of the town’s children meets with a gruesome end. As it turns out, the mansion is the real star of the movie; it has been designed to push as many spook buttons as possible, replete with cobwebs, clutter and creepy-looking wind-up toys. As Kipps sorts through papers he finds in the mansion, he begins to sense movement around him. He sometimes catches a glimpse of a ghostly lady in black, who seems to dart around the periphery of the frame. The core of the movie rests on fun-house effects and how Radcliffe responds to them. Alas, Watkins gets more mileage from the former than from the latter. You’d think that by now, Radcliffe would have mastered the art of reacting to special effects, but he goes through most of The Woman in Black without showing much personality. He does, however, evince steady sprays of gleaming-eyed intensity, as well as a bit of stubble, perhaps to reassure us that his boy-wonder days are done. The supporting players add old-pro polish. Ciaran Hinds plays Mr. Daily, one of the few locals who’s kind to Kipps. It turns out that Mrs. Daily (Janet McTeer) has gone round the bend as the result of the loss of her young son. Mrs. Daily treats her small dogs as replacement children. The twins, as she refers to them, eat in high chairs at the same table as the Dailys, an image that offers one of the movie’s few humorous moments. With a movie such as this, a lot depends on how all the creepy threads ultimately are pulled tight. The ending, which immerses poor Kipps in what looks like a ton of marsh mud, tends to be a bit overwrought, but stops short of ridiculousness, and the British countryside has been photographed by cinematographer Tim Maurice-Jones in forlorn fashion that speaks of an impenetrable loneliness. The light in the movie looks as cold as the underbelly of a dead cod. If you think about it long enough, you’ll find some subtext here, but you may prefer (with no apologies necessary) to enjoy the movie’s encompassing atmosphere of dread, its ability to give you the chills and the effective way it doles out the kind of jolts that tend to shriek their way through moments of eerie silence.